Lessons of Carnatic music system and its rhythmic language, konnakol. 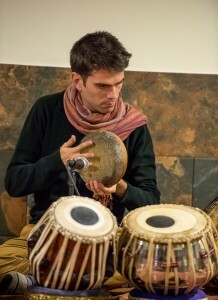 This language is the basis for studying any percussion instrument used in Carnatic music (kanjira, mrindangam, gatham, Morsing). Introduction to kanjira, frame drum originally of southern India known to be made with lizard skin which gives high flexibility, modular resistance and a wide register of sounds specially in low frequencies. Its unique feature is also a single rattle.